The Greensboro News and Record had its genesis in the afternoon Greensboro Daily Record and the morning Greensboro Daily News, both begun around the beginning of the twentieth century and both successful promoters of Greensboro as a railroad and industrial center. Harper Elam, John Benson, and Joseph Reece, printers who probably worked for the older Greensboro Patriot, founded the Daily Record on 17 Nov. 1890. After buying the shares of Elam and Benson, Reece continued to publish the newspaper until his death in 1915. It was then acquired by Al Fairbrother, who sold it to Julian Price and associates in 1919. 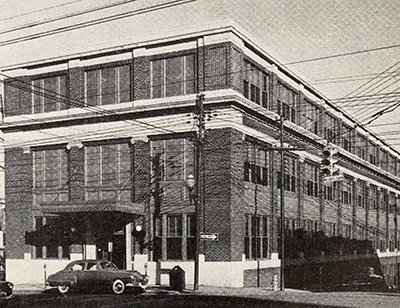 The paper experienced several management changes before its purchase by the Greensboro News Company in 1930. Throughout its early history, the Daily Record identified itself with "independent-Democratic" party politics. The Greensboro Daily News grew out of the old Daily Industrial News, first published by Carl Duncan in 1905 as an organ of the Republican Party. When the Daily Industrial News went bankrupt in 1908, its assets were bought by two Asheville newsmen, Walter A. Hildebrand and George Crater. E. B. Jeffress, also of Asheville, joined them as owners in 1911 and acquired the total assets in 1918. At that time he brought in Earle Godbey of Asheville as editor, A. L. Stockton as managing editor, and A. B. Joyner as business manager, all of whom became stockholders. Hildebrand, from whom the Jeffress associates bought their stock, was a Republican. One stipulation of the sale was that the Greensboro Daily News would always be "kind" to Republicans. The new management of the Daily News considered itself "independent" politically but immediately became identified with Democratic politics through the statewide civic activities of Jeffress. He and Godbey attracted outstanding journalistic talent who went on to distinguished careers at other newspapers, including Gerald W. Johnson, Baltimore Sun editorialist and historian; Lenoir Chambers, Pulitzer Prize-winning editor of the Norfolk Virginian-Pilot; Ernest B. Hunter, managing editor of the Charlotte Observer; and Brodie S. Griffith, managing editor of the Charlotte News. After the Greensboro News Company purchased the Record in 1930, the two newspapers continued as separate morning and afternoon publications. The Daily News had extended its circulation throughout much of the state, and under publisher Carl O. Jeffress and editors H. W. Kendall, Miles Wolff, and William D. Snider it established a national reputation for journalistic and literary excellence. It hired the first book page editor in the 1920s and the first editorial page cartoonist in the 1950s. Among its distinguished staffers in the post-World War II era were cartoonist Hugh Haynie, editor Miles Wolff, editorialist Henry Belk, and Pulitzer Prize winners Edwin M. Yoder Jr. and Jonathan Yardley. The Daily News was also instrumental in the development of college sports in North Carolina, particularly basketball. Legendary sports editor Smith Barrier was an eloquent and tireless advocate during the early years of the Atlantic Coast Conference (ACC), which was formed in 1954. He and his talented staff were among the first to shine a journalistic spotlight on the "Big Four" basketball teams (Wake Forest, University of North Carolina at Chapel Hill, Duke, and North Carolina State), covering the contests and greatly increasing interest in ACC basketball, the state's premier spectator sport. The Greensboro Coliseum and ACC offices are Greensboro institutions largely because of the work of Barrier and the high-quality sports pages of the Daily News. In 1965 Landmark Communications, Inc., of Norfolk, Va., bought the Record and the Daily News, and in March 1984 they were merged as the Greensboro News and Record, a morning publication. In 2006 the paper had a daily circulation of about 90,400 and a Sunday circulation of about 111,000. Ethel Stephens Arnett, Greensboro, North Carolina: The County Seat of Guilford (1955). "Greensboro - Daily News," The E.S.C. Quarterly 9. No. 1-2. Winter-Spring 1951. p.24-25. http://digital.ncdcr.gov/u?/p249901coll22,451988 (accessed September 6, 2012). "Greensboro Record." Civil Rights Greensboro. University of North Carolina at Greensboro. http://library.uncg.edu/dp/crg/personBio.aspx?c=232 (accessed September 6, 2012). "News & Record lays off 41 workers" Greensboro News & Record. June 7, 2007. "Where The Greensboro Daily News and The Greensboro Record are edited and published." The E.S.C. Quarterly 9. No. 1-2. Winter-Spring 1951. p.24-25. http://digital.ncdcr.gov/u?/p249901coll22,451988 (accessed September 6, 2012). 1 January 2006 | Snider, William D.